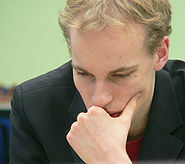 Jan Smeets (born April 5, 1985 in Leiden) is a Dutch chess grandmaster. He was the Dutch champion in 2008. In 2009 he did not take part, but in 2010 he successfully reclaimed the title. Taught by his father at the age of six, he quickly progressed to being a regular on the youth tournament circuit, both nationally and internationally. While he found medals hard to come by at world and European level, he was practically unstoppable in domestic competition, taking gold medals in a number of age categories: Under-14 champion in 1998, Under-16 champion in 2000 and Under-20 champion in 2002 (the latter being shared with Erwin l'Ami). His best performance at the World Junior Chess Championship occurred in 2005, when he took fifth place. Smeets, who hails from the Oegstgeest suburb of Leiden, tried for a year to become a full-time chess professional. However, along with friend and fellow grandmaster Jan Werle, he found that the lifestyle was not to his liking. Relentless study at the chessboard can be a lonely existence and he considered the ‘dead times’ between chess events to be lacking any element of fun. Consequently, he became a student of Economics at Erasmus University Rotterdam and included only as much chess study as his schedule allowed. He finds it difficult to define his chess style, but reflecting on past performances, recalls relying too heavily on tricks and playing aggressively. While this may have cost him a few first places, he describes his lack of nerves as a real asset, helping him gain many extra points and half points at the critical stages of matches and tournaments. 2004 was the year that his participation in senior tournaments began to yield encouraging results. He finished in second place in Gouda (after Daniel Fridman) and gained the Grandmaster title the same year. At Dos Hermanas the following year, he shared third behind Fridman and Bu Xiangzhi (with Sergey Volkov) and at the 2005 Hengelo Stork Young Masters event, he finished one-half point behind the Russian grandmaster Alexander Riazantsev. This was a year of significant breakthrough for Smeets, when he recorded one of his best performances at Wijk aan Zee's Corus 'B' tournament, finishing equal with Shakhriyar Mamedyarov for a share of second place, behind Teimour Radjabov. 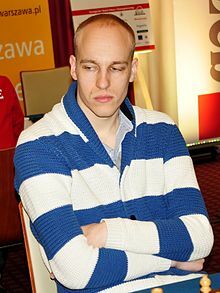 Left in his wake were a multitude of other strong players, including Peter Heine Nielsen, Ivan Cheparinov, Alexander Onischuk, Magnus Carlsen and Predrag Nikolić. He played successfully at the Essent Open in Hoogeveen in 2007, finishing once more as runner-up, this time with Friso Nijboer, Jan Werle and Evgeny Postny, behind surprise winner Eltaj Safarli. In 2008, there were a number of excellent results; he was the winner of the Dutch Championship at Hilversum and finished third at the Howard Staunton Memorial Tournament, after Michael Adams and Loek van Wely, but ahead of Jan Timman, Ivan Sokolov and Nigel Short. He took a share of fifth place at the EU Individual Open Chess Championship, was selected to represent the Netherlands at the Dresden Olympiad and shared second place in the four player Essent (Crown Group) Tournament, after Ivan Sokolov and equal with former World Junior Champion Ahmed Adly. It was also a year in which his Elo rating broke through the 2600 barrier. In 2010 Smeets won the Dutch Championship for the second time. Smeets is a very keen player of team chess and competes in the national leagues of Germany (for Bundesliga team Solingen SG 1868), Belgium and the Netherlands (where he drew with former World Champion Vladimir Kramnik).